We all spend time on the computer. In the last seven years, I have seen an increase in complaints about neck, shoulder, wrist and arm soreness/pain. I once worked with an 8-year-old who was having problems with this neck from looking down at laptop for too many hours. There is a way to prevent these issues. When using proper ergonomics you will sit as though you are driving a car. Your spine should be tall and straight, with your shoulders and arms relaxed. Lower back support is helpful. Both feet should rest flat on the ground or on a foot rest. Elbows should be at a relaxed right angle with the wrists resting on a cushion in front of the keyboard. Eyes and head face forward with the monitor an extended arm's length away. Here are more specifics Read more here. Try to check in on your posture throughout the day with plenty of breaks to get up and walk around and stretch. 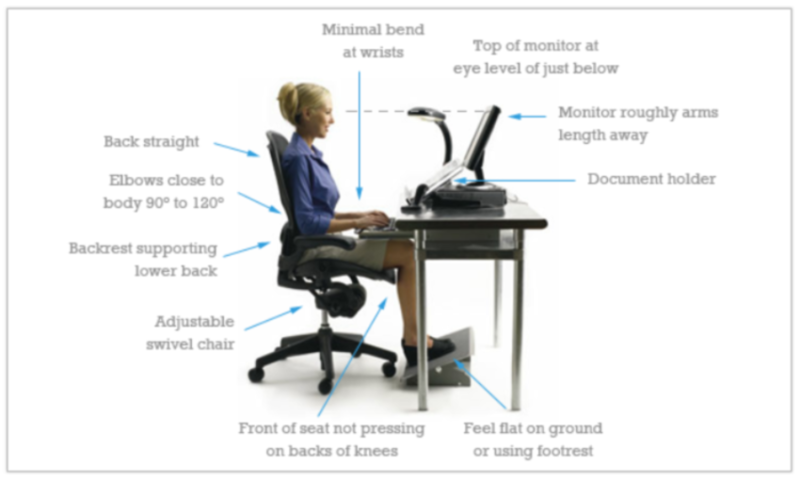 This is a good way to avoid chronic pain related to posture and repeated movements. Stay tuned for the next post which will focus on stretches you can do during the workday to further relieve muscle fatigue and soreness.